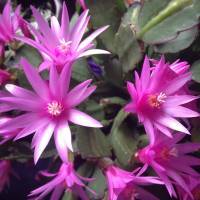 Cactus house plants are easy to grow and vary widely in size and shape. There are hundreds of different kinds of desert cacti, all of which are succulents. A cactus is distinguishable from other succulents by areoles, the small sunken or raised spots from which spines and flowers emerge. The golden barrel cactus (Echinocactus grusonii), shown at left, is one of the most popular cactus house plants. This globe-shaped cactus is slow-growing, but can grow to 3 ft (90 cm) in diameter. Its prominent ribs are covered top to bottom with yellow spines that can reach up to 2 in (5 cm) long. You can expect this cactus to produce bell-shaped yellow flowers in the summer. Gynmocalycium quelianum is slow-growing, but the beautiful white blooms are worth the wait. Coryphantha andreae typically will not flower until it is several years old. Then it produces big, shiny, daisy-like flowers in spring and summer. Aylostera kupperiana has big, fiery orange-red flowers. 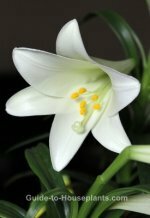 Put it in a sunny window and you'll enjoy a succession of blooms for several weeks. Repot in spring when the roots have filled the pot. Move the cactus to a pot only 1 size bigger. A pot that's too big will hold too much water in the soil, which can cause root rot. It's a good idea to use a terra cotta pot because the porous material helps the soil to dry out faster. Light: At least 2-3 hours of full sun a day. Water: Water regularly spring through fall while plant is growing, sparingly in winter. If the plant appears shriveled and wrinkled, it's underwatered. To rehydrate it, water lightly, and then again the following day, and it will recover nicely. Be careful not to drench the soil. Cactus is likely to rot if its roots become soaking wet. Tap water is hard on cactus plants and can cause hard water stains. Use distilled or rain water and water from the bottom or water the potting mix. Humidity: Average to dry air. Temperature: Average room temperatures 65-75°F/18-24°C. In winter, a cooler place to rest -- 50-60°F/10-16°C at night is ideal. Soil: Use a potting mix that drains well. 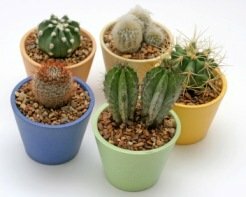 You can buy a mix specially made for cacti, or use 2 parts all-purpose potting mix with 1 part sharp sand or perlite. Adding about a 1/2-inch layer of pebbles to the bottom of the container will help drainage and also add weight to the bottom. (Large cacti can become top-heavy). 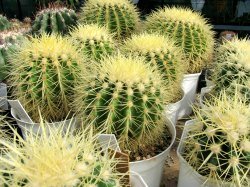 Fertilizer: Typical cactus house plant fertilizer is 2-7-7. 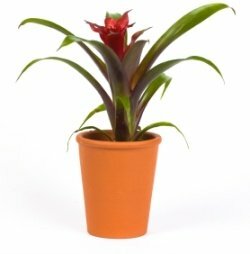 It needs less nitrogen than foliage plants and higher phosphorus and potassium for better flowering and strong roots. Propagation: Many cacti grow offsets at the base of the parent plant. Cut them away with a sharp knife. Allow the cut surface to dry for a couple days so it doesn't ooze sap and to prevent the new plant from rotting. Place offsets on the surface of moist, sandy potting mixture. Keep new offsets in a warm, bright place, but out of direct sun for the first month. The best season to propagate is late spring or early summer, when plants are beginning their most active period of growth. 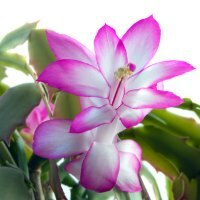 Looking for a Holiday Cactus? 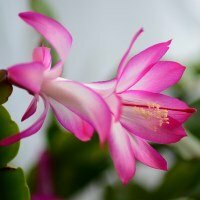 Although true cactus, these holiday favorites are native to tropical rain forests and require much different care. Find out how to keep them healthy and what makes them bloom year after year.